A master’s degree in ministry covers advanced topics in theology, communication, and spiritual development, and the graduate curriculum equips students with the wisdom and skills they need to effectively serve others through positions of spiritual leadership. Required for ordination to the clergy and other appointed careers in ministry, a master’s program also allows students to explore specialized topics in the field. With an average annual wage of $49,450 for those employed by religious organizations, some graduates also seek ministry jobs in hospitals and other health facilities. Not every local college offers a ministry graduate program. 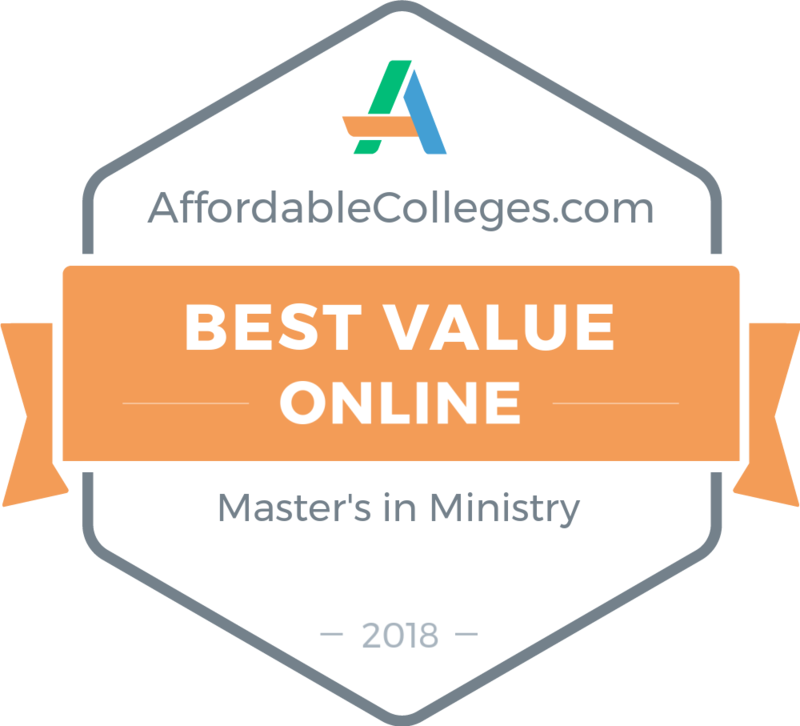 Earning a master of ministry online is a cost-effective and convenient way to enter the next phase of your spiritual and professional development. An online ministry degree program offers the same intensive learning experience as its traditional counterparts, but at a fraction of the cost. Designed with busy individuals in mind, online ministry programs include flexible schedules that let you study when and where it is most convenient for you. Offering some of the lowest tuition rates and the highest ROI in the country, the accredited schools on our ranking combine accessibility and affordability with rigorous and challenging plans of study. IWU's affordable online ministry degree challenges students with a curriculum built around ministry in action. The 36-credit master's of theological studies is designed for students already serving or volunteering in ministry. Graduates are prepared to be effective church leaders and transformational guides. The program includes 18 core credits and 18 elective credits, with specializations such as pastoral ministry and worship arts. Some specializations require the completion of a capstone or team project. Students pursuing IWU's master's of ministry online must attend an on-site orientation at the Marion campus and a two-day seminar 18 months into the program. The program's cohort model fosters fellowship and accountability. Professors with ministry experience guide students as they apply classroom lessons to local ministry. Huntington University offers two online programs in ministry: pastoral leadership and global youth ministry. Both degrees are Bible-based and rooted in theological principles. Students earning their ministry degrees online from Huntington complete courses in qualitative and ethnographic research, which identify challenges within specified ministry populations. Each program culminates in a field-based research project. Both of Huntington's affordable master's of ministry online programs take two years to complete. Online courses are offered every other year, in seven-week formats. Applicants should have completed nine undergraduate credits in biblical studies and theology, with a 3.0 GPA. Applicants must submit two recommendations, including one from a spiritual mentor, and three essays regarding the student's calling, salvation, and ministry experience. Huntington students whose GPA falls below 3.0 are placed on probation. Faulkner University's affordable online ministry degree, an MA in christian counseling and family ministry, combines academic components from the Kearley Graduate School of Theology and the Alabama Christian College of Arts and Sciences. The 36-credit master's of ministry online program requires twelve graduate courses: five in family studies and seven in counseling. Faulkner's online ministry degree does not confer licensure; it prepares students to provide ministerial counsel and family guidance in church settings. After completing 30 hours of coursework, students pursuing a master's of ministry online must pass a comprehensive written and oral examination before continuing their studies. Applicants must have at least a 2.5 undergraduate GPA and must submit a statement of purpose and a recommendation from a church leader. Transfer students may bring a maximum of six graduate credits in biblical studies, and Faulkner students must maintain a 3.0 GPA to graduate. SAGU offers several online programs in ministry, including an MA in practical theology and an advanced degree in children and family ministry. Undergraduate prerequisites for SAGU's online programs in ministry include Old Testament literature and biblical preaching. Students earning their ministry degrees online complete a supervised practicum, along with courses in research literature and technology, which teach students to write formal papers in their chosen field. Each SAGU ministry program requires 24 credits of professional courses, along with several electives for a customizable degree. Online courses are delivered asynchronously through Blackboard and Tegrity. All students pay the same affordable per-credit tuition rate. DBU offers several ministry degrees online, including graduate degrees in children's and family ministry. Both 36-credit online programs in ministry combine academic training with practical ministry applications. The curricula include 18 core credits, 9 program-specific credits, and 9 concentration credits. Concentrations include special needs, leadership, and Christian counseling. Both programs explore biblical foundations of family ministry and require field-based service learning components. Prerequisites for the MA in family ministry include Old Testament survey, New Testament survey, and an upper-level theology course, which are all available online. Applicants to DBU's affordable master's of ministry online program must have a 3.0 undergraduate GPA, two letters of recommendation, a statement of purpose, a current résumé, and active membership in a Bible-based church. Transfer students may bring up to 18 approved credits.